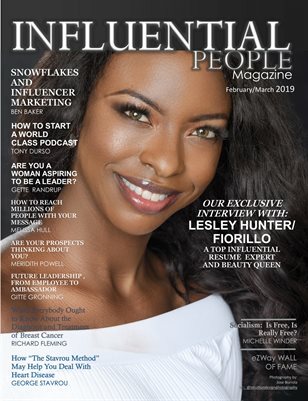 Our mission of Influential People Magazine TM is to give Influential People who are making an enduring impact on people lives around the world, a entrepreneur platform to give more exposure to share their talents, skills, gifts, experience, success, and more. Our definition of an influential person is someone who chooses to impact those around them for the better, someone who encourages people to think beyond their own life so that they will aspire to inspire others. Influence is not enforced but gently led by personal example and. education. While big media would convince us that the world’s influencers are all on the ‘main’ stage we at Influential People Magazine disagree. Yes, we may read a book or see someone in a news report, but those people are too distant from our own sphere to make them relatable. We know, it is those in our communities who truly influence us, who teach us and inspire us, not by one deed but by how we see them live. The team at Influential People believes passionately in spreading that message and understands the need to provide exposure for people on a local level. We work hard to provide a forum for coaches, mentors, authors, writers, trainers, speakers, business owners, entrepreneurs, photographers, event producers, health & wellness practitioners, teachers, icons, heroes. We consider these people to be leaders whose voice and a story has still to be told to the world. Influential People Magazine is known as a place for emerging Influencers. Will you be a influencer or will you find your next mentor in our pages? Ready to be featured inside? Did you read our submission requirement?